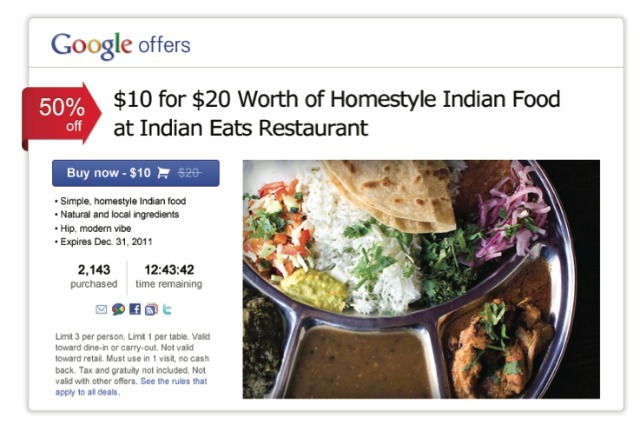 Google is planning to launch Google Offers, a deal-a-day competitor to group-buying site Groupon after failing in its $6bn bid to acquire the latter last year. Social media website Mashable broke the news overnight providing exclusive documents to verify the news. In the US, group-buying is mega business with Groupons 12 month revenue to Sep 2010 at 465 million and plans for an IPO later this year. The No.2 LivingSocial has entered into a partnership deal with Amazon and yesterday broke the industry record, selling 1.3mn deal vouchers by offering $20 Amazon gift cards for $10. As competition grows, each website will vie to source the most attractive deals from merchants and keep growing their database of subscribers. With its strong brand recognition and vast in-house advertising and engineering resources Google should be able to give the existing players a good fight. Google has existing connections with local businesses (through Google Places, Adwords) and consumers (through Google Search, Google Maps) that can be used to promote and acquire scale for the new service. It could also integrate a Google Offers widget on the millions of Android smartphones shipped daily worldwide. 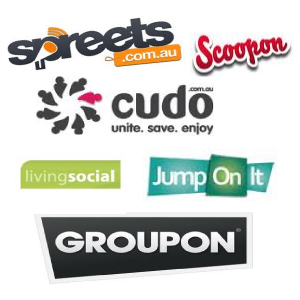 In Australia, the group buying landscape has seen hot competition with the top 5 of Spreets, Cudo, LivingSocial, Jumponit and Scoopon and numerous smaller players. Around these there are also sites that aggregate the best daily deals like Alldeals. Dell Australia also has its own group-buying site at Dell Swarm. This weeks acquisition of the AU and NZ operations of Spreets by Yahoo7! for an unconfirmed sum of $40 million further underscores the potential big players foresee in the market. Groupon is yet to launch completely in Australia due to a domain squatting dispute with one of its clones Scoopon which owns the groupon.com.au domain. Groupon has created an Australian website Stardeals which is currently soliciting members and offers $10 credit for every additional member recommended. That Groupon is not yet a household name in Australia is an advantage for the existing players and new entrants like Google. Time will tell whether we will see a shakeout once Google and Groupon establish themselves locally. In the meantime watch this space for more updates.